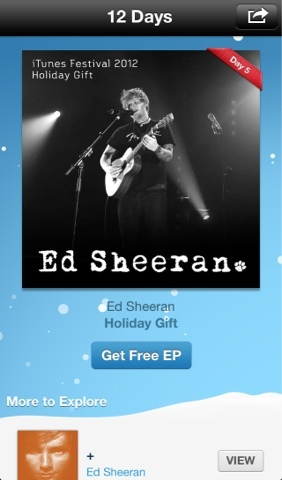 It's day 5 of Apple's gift giving days and today they're giving away Ed Sheeran Holiday Gift EP. The EP includes the live versions of Drunk, the small bump, and The City. As previously mentioned you don't need to download the 12 Days Of Christmas app to get access to these freebies, you just need to know which items are actually free and you can search for them in the App store or iTunes for this one, just search for "Holiday Gift Single" in the iTunes store. For Apps, even folks over at the USA who don't have this Holiday promo going on can get access to Apps, however, for Singles and EPs, you need to be at the iTunes store where the 12 days of Christmas is available.